Is this what happens when that monster under the bed uses you to practice ventriliquism? 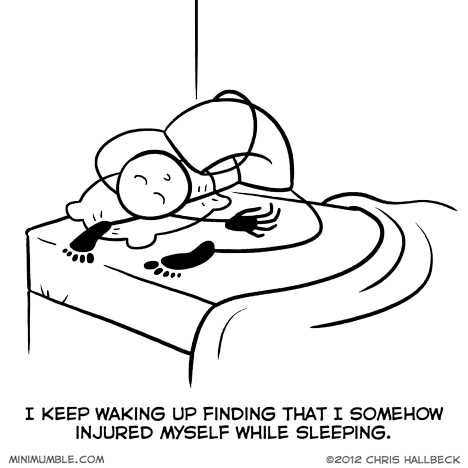 That might explain why I never have this problem: The monster under the bed is afraid of me. i’ve been told it looks like i wrestled a bear in my sleep before. My brother crosses his legs and leans foreword when he sleeps. Late last year I had a calf muscle tear overnight and somehow never noticed (which is amazing partly because it should have hurt like hades, I don’t sleep well to begin with, and I usually wake up several times a night). I attribute the source of the injury to having walked half a mile the afternoon before, but I felt all right during the walk and after it was over (not great, thanks to chronic illness, but all right). When I woke up the next morning, I wondered if I had somehow been run over by a truck in my sleep.